The Stardub team, along with TMUK’s finest and anyone else who wants to come along shall be gathering for our annual Scottish gettogether. During said weekend, there will be booze. Trips to toy and comic shops (and the comic mart in Glasgow) inbetween the booze. There will also be some dreaded competitions which will let you win a fabulous prize or two, also anyone who turns up will get a free copy of the printed edition of my comic adaptation of Another Time and Place. 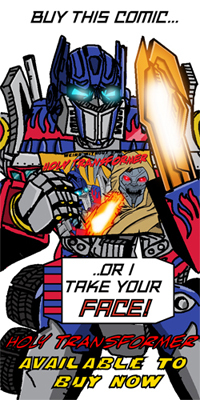 Another Time and Place is the last prose text story and the last original Transformers material from Marvel UK. If you plan on coming let us know by chiming in on the comments here or via twitter or hitting up the Scotcon thread over at the TMUK Forum.